Well I read this challenge wrong, but fortunately my card worked out! 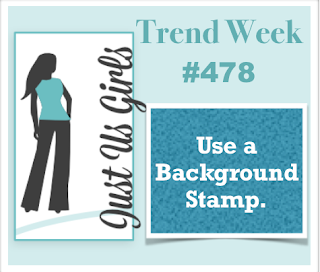 I thought the challenge said stamp a background. Fortunately, I am producing cards [to go on vacation] so fast, I am CASing out my cards. I used this background from MFT [retired]. I do love my some dots! Either way, it's stamped using a background stamp :). As I said, I got lucky. BTW, I absolutely LOVE this sentiment! A life motto for sure. Your turn. 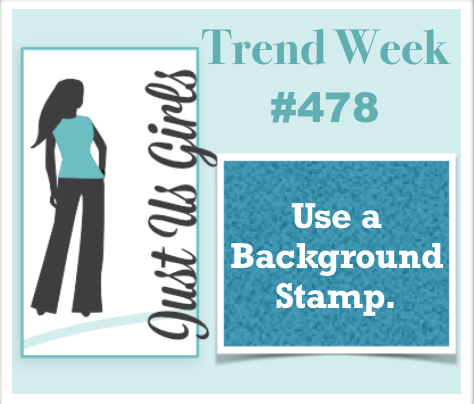 Come on over to the Just Us Girls Challenge, and show us your backgrounds! Great card and a great sentiment. I am loving all of those polka dots! And that sentiment is one to live by. I like the pattern in the dots, this is fun! The dots really look neat, Vikki! And you're right--great sentiment! Hope you're having a good vacation! Super cool card Vicki. Brilliant sentiment. You got lucky, but either way it is a pretty card! Love those dots and that sentiment is very true! A good one to live by for sure!